Are you done your Christmas baking? I was. M&M's are my favourite candy - by far. Ask anyone. Okay, ask anyone that knows me. ~Heat oven to 350º. Spray 13x9 inch pan with nonstick spray. In large bowl, combine brown sugar & butter; beat until smooth. Stir in oats & cereal. Add flour, baking soda & salt; mix until well blended. **Reserve 3 cups oat mixture for topping. ** Press remaining mixture in bottom of sprayed pan. Bake at 350º for 10 minutes. ~Meanwhile, in a small saucepan, combine caramels & milk. Heat over low heat until caramels are melted & mixture is smooth, stirring constantly. ~Remove pan from oven. Sprinkle 1 cup of the M&M's evenly over base. Drizzle with caramel mixture, being careful not to let caramel touch the sides of the pan. (Sounds like such a little thing, but trust me, you will have a heck of a time getting the bars out of the pan if they are caramel-glued to the sides! I'm speaking from first hand experience here.) Drop reserved oat mixture by heaping teaspoonfuls over caramel mixture. Sprinkle with remaining chocolate pieces. ~Return to oven; bake an additional 20-25 minutes or until centre is set & top is golden brown. Cool 1 hour or until completely cooled. Cut into bars. Store in an air tight container in the refrigerator. 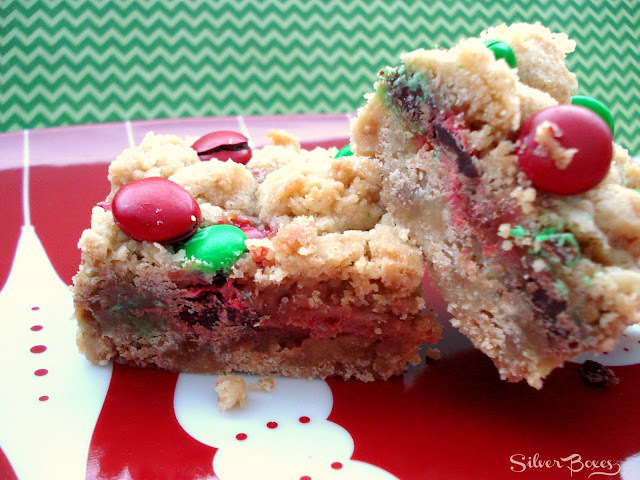 Look at the layers of candy & caramel - delish! I hope you're having a wonderful countdown to Christmas! WOW! Those look amazing! I'd love you to come link up at my Pin Me Linky Party. I CAN"T WAIT to try these. 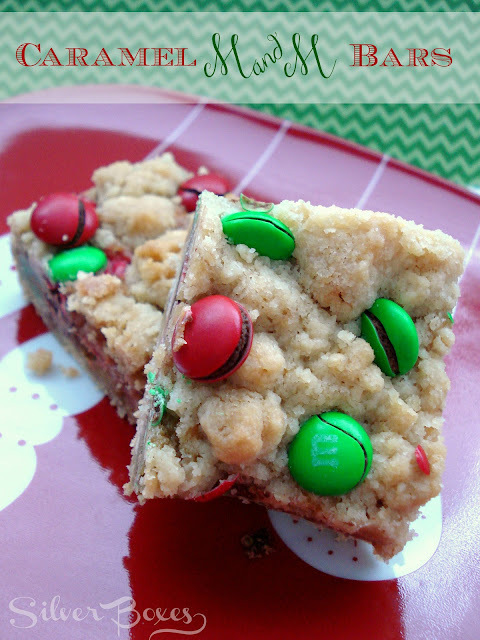 I've always made M&M bars, but never with caramel. Why didn't I think of that?!? And the Rice Crispy cereal in them sounds great! Thanks for sharing your idea!! It's been pinned. MERRY CHRISTMAS! Those sound delicious!! I must try them! thanks so much for sharing at Thursday's Temptation. I am going to be featuring these tonight on my blog!